Experience the Land of Jesus in 2019! Come with us to Israel March 19-29, 2019. The deposit for this trip is $1,000. Our group departs Newark for Tel Aviv, Israel. Arriving Tel Aviv in the morning, we board a tour bus to visit the beautiful northwest region of Israel including Caesarea by the Sea, Mt. Carmel, Megiddo, Nazareth and Tiberias. We’ll overnight at the Kubbutz Nof Ginosar overlooking the Sea of Galilee. Nof Ginosar is home to a 1st century fishing boat. 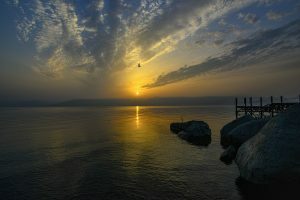 You’ll be able to envision how Jesus and his disciples crossed the Sea of Galilee. Today we’ll visit the historic spots where Jesus lived and ministered. 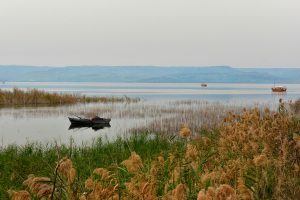 We’ll start with a boat ride on the Sea of Galilee. We will then visit the Mt. of Beatitudes, Capernaum – the city of Jesus, Tabgah, and then return to Kubbutz Nof Ginosar. On this day, we will head up to northern Israel visiting Tel Dan, Caesarea Philippi, the Golan Heights and the Jordan River Yardenit baptismal site. We plan to host a baptism for our group. 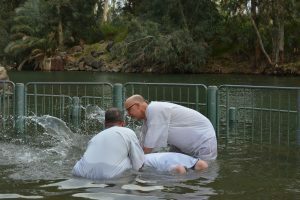 If you have not been baptized, this is a great time to do it. We again overnight at Nof Ginosar. Today we depart Galilee by bus for Jerusalem. Along the way we will visit Beit She’an (an amazing excavated city). We will enjoy the beauty of the Jordan Valley and visit both old and new Jericho. In the afternoon we will enter into Jerusalem, the Eternal City. We’ll then visit the Mt. of Olives, the Palm Sunday Road, and the Garden of Gethsemane. In the evening we will check into the beautiful Inbal Hotel in Jerusalem, where we will stay for the rest of our trip. On this day we will focus on the Old City in Jerusalem. We’ll walk through the Jewish Quarter and make a very moving visit to Caiaphas’ house, the place where Jesus experienced one of his trials. Then it’s on to the City of David where we will stand in the place where David may have penned some of his Psalms. Later we will stand on the Southern Steps of the Temple; these are the very steps that Jesus and the apostles trod when they ascended onto the Temple campus. That night we return for a great meal at the Inbal. DAY 7 Monday, 3/25/2019 – Free Day! We love giving our tour participants a free day in Jerusalem. Just wandering through the Old City is a cultural experience. Our tour participants often plan lunch with new friends and shop for souvenirs. Today we head south, descending into the Dead Sea region. We will visit Qumran where the Dead Sea Scrolls were discovered. Then we’ll head further south to En Gedi (where David hid from King Saul) and we will visit Masada. 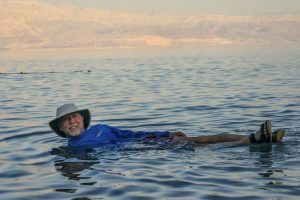 On the way back, our group will enjoy a swim in the Dead Sea. We start day nine by visiting the Western Wall, considered the most important Jewish synagogue in the world. We’ll give you some time to pray at this historic spot. From there we head underground into the Western Wall Tunnel to see the stunning manner in which Herod build his temple. After lunch we travel to the new city of Jerusalem to visit Yad Vashem, the Israel Holocaust Museum. From there we visit the Shrine of the Book and the model of Jerusalem as it was in the time of Jesus. We end with a stunning overlook of Bethlehem before we return to the Inbal Hotel. On our last day we focus on Jesus’ last days. We will visit the Temple Mount, the Pool of Bethesda, the Praetorium and the Fortress of Antonia. Then we’ll walk along the Via Dolorosa, the route Jesus may have used when he carried his cross to Calvary. 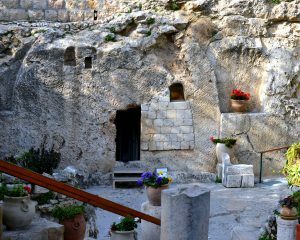 We will visit the Church of the Holy Sepulchre and end up at the Garden Tomb where we will take communion. We will have our farewell dinner in a restaurant near the village of biblical Emmaus. Then it’s on to Tel Aviv to meet our flight. Our group arrives back in the US. 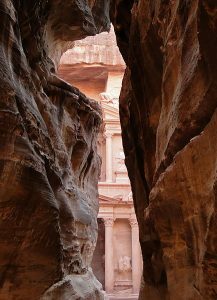 The Post-Tour: Visit astonishing Petra, and then imagine worshipping at the Tabernacle in the Wilderness. Our post-tour group spends the night at the Inbal Hotel. Today we travel by bus through the Negev desert to the Timnah Nature Reserve to view the model of the Tabernacle in the wilderness. We then visit the town Mizpe Rimon and the nearby crater, as well as Midreshet Ben Gurion, where we will visit Ben Gurion’s home and grave. David Ben Gurion was the founder of the state of Israel. Then it’s on to Eilat where we will overnight by the shores of the Red Sea. After a short drive to Petra, a World Heritage Site, we will meet our Jordanian guide, and enjoy the remains of an ancient culture, with architectural gems that still amaze. We then cross the border and return to Eilat. Today we fly from Eilat to Tel Aviv. We’ll then depart for the United States. Arrive in the United States with lots of pictures and some great memories. Please note: Because we’re seeking to find the best way to deliver value to our trip, our itinerary may be subject to change.